TV Frog Reviews - Is it a Scam or Legit? 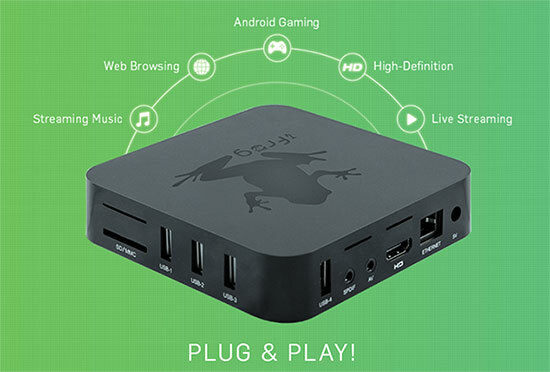 Manufactured by Strong Current Enterprises, TV Frog is a plug-and-play Android-based streaming media device that claims to help you enjoy all your favorite content. TV Frog is an Android media hub that connects to your TV via Wi-Fi or Ethernet and allows you to stream your own media, such as photos and videos. After downloading the appropriate apps, you’ll also gain access to movies and TV shows from popular media services like KODI, Netflix, Hulu, and YouTube—and in crystal clear 4K Ultra HD. But before you hand over your money, you’ve come here to learn more about TV Frog, and whether or not it’s the right device for you. Will it really “make your TV smart”? And even if it will, are there other devices competing for your dollar? Let’s start helping you make a more informed decision by taking a look at TV Frog’s specifications. What Is TV Frog & How Does It Work? As you probably guessed, TV Frog represents the hardware in this equation. Basically, it houses software that processes signals received through a Wi-Fi or Ethernet connection and translates them into images that appear on your TV. It also houses downloadable third-party software (or apps) that can enhance the viewing experience, including popular options like Netflix, HULU Plus, and Sling TV. You can store as many apps and other media as the device's hard drive can hold. What Are TV Frog’s Specifications? As mentioned, TV Frog works over a Wi-Fi or Ethernet connection. It also features 1GB RAM and 8GB memory, utilizes a Quad-Core Cortex A7, 2.4GHZ CPU, and runs on an Android version 6.0.1 Marshmallow operating system. According to the website, you’ll be able to access a cue sheet, tag your files, integrate with MusicBrainz, and create smart playlists. TV shows can be viewed by episode and season, and can be sorted by watched status, description, and actors. If you need to browse the web or stream content directly from the Internet, you can also use TV Frog’s wireless mouse after connecting its USB Bluetooth receiver into the back and downloading the browser app. TV Frog is an Android-based streaming media hub that allows you to download files, download popular apps, and browse the internet using the included mouse. Image credit: Strong Current Enterprises Ltd.
What will you pay for all of these features? How Much Does TV Frog Cost? Each unit includes a TV Frog, one HDMI 4.1 cable, one wireless mouse, and one AC/DC adaptor and power cable. At the time of our research, the company was also offering a free universal power adaptor and surge protector they claimed will allow you to use TV Frog, or any of your other devices, in any country in the world. All TV Frog purchases do not come with a 100% guarantee, although after reading through the Terms, we learned that this guarantee comes with some fairly strict guidelines. First, we’re told that all products are sold “as is” and all sales are final. In other words, there are no refunds, only exchanges permitted. In order to request an exchange, customer service can be reached at 888-836-8088 or support@freeseetv.com. Are There Any TV Frog Customer Reviews or Feedback For the Company’s Other Products? We didn’t encounter any firsthand customer feedback for TV Frog at the time of our research, although we did find an in-depth Snopes article titled Is TV Frog a Legitimate Alternative to Cable? This means that, in order to watch legal content from third-party services, you’ll need to pay extra or sign up for a subscription (depending on the specific service). From a company perspective, TV Frog is brought to you by Strong Current Enterprises Ltd., based out of London and in business since 2010. Despite their time in business, the only other product Strong Current had brought to market at the time of our research was HDZoom 360 (also sometimes referred to as HD 360X Zoom), although it also didn’t feature any customer reviews, either. 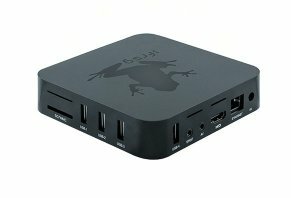 Lack of feedback aside, how does TV Frog stack up against the competition? Remember, as the Snopes article above mentions, TV Frog simply provides an internet connection to any television set, while also providing a graphical interface that can be used to view content. In other words, it’s a media streaming device. But, there are a whole lot of streaming devices competing in the same marketplace as TV Frog, including behemoths like AppleTV, Roku Premiere, Google Chromecast, and Amazon Fire TV. Does it fare well? In addition to these options, there are perhaps thousands of other generic Android-based streaming devices from third-party companies. In fact, if you enter the phrase “Quad-Core Cortex A7, 2.4GHZ” into your favorite search engine, you’ll encounter several streaming devices that make many of the same claims as TV Frog, some of which were available for as little as $40 at the time of our research. Comparatively, while these Android options might move your television into the online realm, they typically feature less robust functionality than some of the mainstream competition above (i.e. not as many popular apps available). Perhaps TV Frog’s biggest advantage is that it offers a built-in browser, although the fact that you’ll have to use a mouse means you’ll have to be sitting next to a flat surface (versus in the middle of your couch under a blanket, for example). It’s also positive that the device features four USB ports, although 25% of these will be taken up by the mouse’s Bluetooth receiver. TV Frog’s 4K output capability could certainly appeal to movie buffs, but it’s important to keep in mind that the content you’re viewing must be transmitted in 4K, and your TV must be able to display 4K. In short, don’t think that TV Frog will magically turn the picture quality on a circa-2001 TV set into something you’d expect on something like the Samsung QLED TV. Let’s carry these thoughts over to the next section as we come to an educated conclusion about TV Frog. If you’re simply looking to move your TV into the 21st century and connect it to the Internet, based on what we learned from the device’s website (we didn’t test it firsthand), it seems like TV Frog is a legitimate product that might get you there. And with its wide variety of inputs, it seems like it could also act as a central hub for connecting a handful of other devices and media (although it might not represent the most elegant option). In the end, though, we don’t think the most important question related to TV Frog is one of legitimacy; it’s one of value. In other words, if you’re only interested in gaining online access through your TV, and then using it to stream different media directly, there are dozens of valid options from mainstream manufacturers that can be purchased for less than $50. Which, as consumers ourselves, might deliver more value than TV Frog. On top of this, these mainstream options will typically support a broader range of content services, which might be important if you’re looking to add a Netflix, HULU Plus, etc. subscription at some point in the future. They’re also typically backed by trained support staff who can get you back up and running quickly if something goes wrong. Finally, many of these mainstream devices come with solid refund policies and warranties, neither of which seem to be provided by Strong Current Enterprises. As such, make absolutely sure you want to purchase TV Frog before pressing the order button. Before you go, talk about your TV Frog experience below by writing a review. Today March 11, 2019, my return packaged product was returned. I sent it 3 units back for a refund because they did not work on June 16, 2017 (2 years since I sent it). No refund, no communication. Now I am out another $51.00 shipping. The biggest scam I have ever fallen for. I contacted the tech support through email, requesting the Flash Firmware software. The answer is below. I need the firmware rom flash file so I can restore it back. We are very sorry to hear that. May I know if it shows any error message? Believe me, I have an issue since the day I ordered this TV box. This Frog is set up like a computer, and with all its options, it's a joke. And I won't even go into how much they charge for this crap. Then says final sale and no returns! Good scam guys. Everyone gets taken at least once. Shame on you! Ships by cargo-ship, so very long wait! But works. I paid US funds thinking it was a US product, but no. The tracking info shows it left the port in Singapore, Hong Kong after a few days! So it took nearly 3 months to get to Canada. Then 2 days to get to Toronto when it finally arrived. Perhaps a low level of air-mail option might help this company with a lot of the complaints? Now, I know nothing about android, Kodi, Netflix, etc., but I can DL full TV series from the net to a USB stick to watch on my massive smart TV. So I plug it all in, swap the TV to the correct HDMI port, and "walla!" The frog is up and running! Over the next 10 minutes, it is updating some stuff, we get the GMT time set, and many apps are preloaded and like Google, Gmail, web browser, others all working (annoying with mouse only, now looking for a wireless keyboard). Kodi didn't completely work, however (the main thing I wanted out of this)! My techy friend noticed right away that Kodi was v16.x and should be a v17.x. Looking online he found a tutorial to help with using the Frog's Google/web browser to download the latest versions of Kodi (and even more apps from Google Play), then uninstall the old and reinstall the new versions. Then another app inside the Frog when chosen noticed several more of the Frog's apps are out of date and asked to allow the updates. I have now given Kodi the add-ons I want, and am now watching all the shows that are NOT on my TMN/HBO package, or TV on Demand that seems to hold episodes for a few weeks only. Note. There is no "off" button? So I leave it plugged in and reset it if I need too. So a "switch" or "reset" button would be nice! Also, many are complaining about the mouse quitting? It's a wireless mouse, and to save the battery it auto shuts off, so simply push the center button behind the wheel to activate it again! It is very cheaply made, but it does work fine. I would recommend this only to those techy enough to set-up and update their own computers and swap viewing modes on their TV, as that's required after the "plug'n'play." I got the unit three months ago. It worked like a champ from day one. I started reading these reviews after I had ordered it and was concerned that I was being scammed. When I got the Frog and hooked it up, I was pleasantly surprised that it worked better than advertised. I haven't had a lick of trouble with the Frog and it runs almost the programs that are meant for Kodi. I'm glad I purchased the TV Frog and would buy one again. It has been powered up and running for three months now and hasn't hiccuped at all. I would give it a 4.9999 out of 5 stars. No unit is perfect, but this one is VERY close. Do not even think about buying this worthless product. It just does not do anything. It is easy to hook up, but then it will not let you access anything. That is the reason they will not refund your money since they know this product is worthless. I should have read the information about returns better, but it at first appeared they would back their product 100%. I guess they will exchange it for another TV FRog if you return it in the original package, but since their product does not work, it does not make any sense to return their product for another one that does not work. Cheap plastic crap; didn't work. No customer service. You would get more entertainment from lighting your hard earned money on fire then buy this junk. Buyer beware. The mouse is junk, there is no off button, so you have to unplug it every time it needs to update, and the plug it came with is loose in its socket. Can you say "fire hazard?" So no, I don't recommend this worthless junk unless of course, you like flushing money down the toilet. I finally got my refund. I ordered my TV Frog on June 24th and it took three months to be delivered, and I could not get in touch with anyone. I was dissatisfied with the product, and after sending several emails to the company, they finally emailed me back on September 18, 2017. I was told to send back the TV Frog for a refund. The address was Customer Service, Postbus 202, 6670AE ZETTEN, Netherlands. I mailed the Frog back on September 29, 2017, at the cheapest price I could find. I then received an email on November 9, 2017, stating that they received the package and I would get a refund in a few days. I received the refund back into my bank account today, November 13, 2017. It takes a little patience. I hope this helps anyone having problems with this item. I had a difficult experience receiving this equipment (which should have told me something), although they took my money easily enough. When it would not work on my Samsung TV, I tried calling and emailing their customer service number (because they never answer the phone), and have yet to hear from them. I intend to file a complaint with the Better Business Bureau. The power adapter "kaput" mousses freezing, what else? The crap does NOT work, but they got my money. A bunch of CROOKS. I don't believe that they'll even want to refund the money, so I don't even bother because I don't want to waste more money paying the shipping. Despite four emails following a mail of how to use the Frog, I have had no reply from this company. I placed an order and paid for one unit. I was advised that the item had been dispatched but since then, nothing; no box, no contact. I advised I would review and post my thoughts on all multimedia and still no box and still no response. I suggest that if anybody is thinking of placing an order, don't. Maybe now that I have placed a review here someone at support@freeseetv.com will respond.